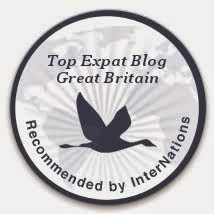 At the end of August we headed to southwestern England. The impetus for our trip was to get Kate's veterinary license in the U.K., as mentioned here. Her appointment was on a Tuesday, in London. Since we've previously visited London, we decided to take a long weekend and explore a part of England where we've never been. On the Friday afternoon we flew from Glasgow to Bristol. We didn't spend any time in Bristol, just picked up a little rental car and drove to Bath on delightfully narrow country roads. Sometimes, the road was not wide enough for two cars to pass, but no one seemed to mind, even though we were often walled in by giant hedges. Fairly similar to Scotland, really. No escape! This photo was taken from the passenger's side, so the view on the driver's side is even more unsettling. Bath is a tourist's dream. Its attractions span the ages: ancient Roman, medieval, Enlightenment (i.e., Georgian), Victorian, and modern. Bed and breakfasts abound. Great restaurants. Beautiful parks. A river perfect for boating. All the sites are compact and walkable; indeed, you'd be foolish to drive and miss the experience of wandering in the town. Flowers and charm and beauty seem to ooze out everywhere. So, of course, I have too many pictures. Way too many pictures. Medieval cathedral, wide Georgian avenues, flowers, creamy limestone — a snapshot of Bath. Consequently, I'm dividing up an ungodly long unwieldy blog post into a handful of comparatively shorter posts. This post will focus on the Roman spa that gives Bath its name. As a town established by the Romans in the AD 60s, Aquae Sulis ("waters of Sulis") took advantage of a natural hot spring. 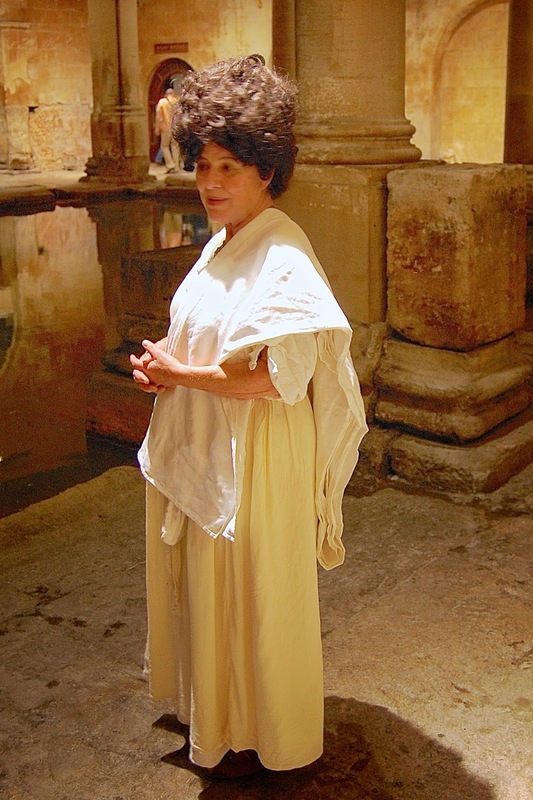 Although originally the Romans just built a temple over what had previously been a shrine to the native Briton god Sulis (whom the Romans associated with Minerva), by 200 AD they had built a spa complex of a hot bath, warm bath, and cold bath (calidarium, tepidarium, frigidarium). After the Empire collapsed in the fifth century, the spa fell into disuse and silted up. Eventually, the local inhabitants had no idea the Roman bath was nearby and below them. Though there were still places to bathe in the hot springs, the spa was eventually filled by silt and then forgotten. The town carried on in importance due to its church, and an English king was crowned in Bath in the 970s. But gradually the town declined until only a few thousand inhabitants remained in the sixteenth century. Late in the sixteenth century, the baths were improved and Elizabeth I issued a royal charter to make the town into a city. In the 1700s the city exploded in popularity because of the supposed restorative powers of its thermal waters. The city's economic boom resulted in a gorgeous neoclassical city of wide avenues, tall pillars, large doors and windows, and sweeping vistas. This "Georgian" style — so named in England for successive kings named "George" who were ruling at the time, but known to the rest of the world as neoclassical style — now dominates the heart of the city. It wasn't until the 1880s that the Roman baths were rediscovered, though some of the surrounding Roman ruins had been found many centuries earlier. The spa was excavated and then, in classic Victorian fashion, "enhanced" by adding a fake Roman promenade above to look down into the baths. The spa waters are now 18 feet below the modern ground level. Looking down into the Roman spa at Bath, from the Victorian era balcony. Kate and Jackson peer down between two faux-Roman statutes. Your visit to the baths is enhanced by a good museum and extensive audioguide. You get a lot of detailed information regarding topics such as the usage of the rooms, models of the complex, coins tossed for luck into the pools, surviving pediments, and even curse tablets (e.g., patrons cursing people who stole their clothes while they were in the baths). Oftentimes, historical reenactors wander the site to try to give a flavor of Roman life. There's a fair bit of scholarly debate about whether the fellow on this pediment is Neptune, or a Gorgon (but those were usually female), or something else. Are those possibly snakes in his hair? 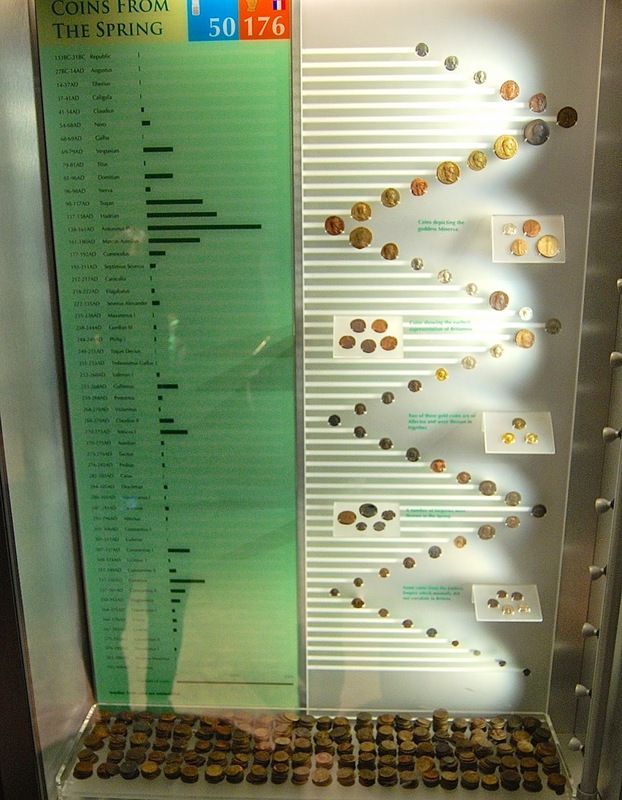 Display of Roman coins found in the spring, dated from 50 to 176 AD. Coin portraits continue in modern times, too. Who knew the Romans sported beehive hairstyles? Looks like your ideal bathing water, right? These little pillars supported the floor. Hot air could flow amidst the pillars and heated the floor and room above. This room is walled off from foot traffic. I think the best time to experience the baths is at night. It might even be romantic. Except for the other tourists. And the toddler. Early or late hours = fewer tourists. Mood lighting in the evenings. Wishing well bath: we donated more than our fair share of coins because tossing them in was Jackson's favorite part of the evening. You can also drink as much of the water as you can choke down want. As a Dickens character opined in The Pickwick Papers, "I thought they'd a very strong flavor o' warm flat irons." Jackson, of course, drank multiple cups. These ruins are one of the best-presented Roman sites I have come across, including Italy. Between extensive displays and a thorough audioguide, visitors can spend hours delving deeply into as much history as they would like. Meanwhile, those who want a quicker visit can stroll through the guided path and still pick up key points merely by glancing at exhibits without stopping. It's very user-directed, catering to different tastes. In the next post, we'll jump ahead more than a thousand years to take a look at the medieval church. So awesome!! I am curious, do you already know all this historical info you educate us lay folk with, or do you learn about it on site at your visits to various places, or do independent research on the topic(s)? Kristen, it's a mixture of sources. Some things I know in advance, from previous historical reading. For example, today I did some random reading in "Basic Documents in Medieval History," a compilation of original medieval sources, just for fun. Quite often, I'm learning things from guide books, though you have to be careful with those sources (e.g., Rick Steves' guide book has a glaring error about the history of Bath). Some things I learn through research, mostly online research. And I learn a whole lot from placards and information sheets and tours and audioguides onsite. So, I likely research more than most folks before I visit, and then I spend more time than most folks when I'm onsite, and then I often look up things that interested me after I leave.